In football there are often what is called “reasons why”…. Reasons why we play 4 quarters. And ultimately Reasons why this is a team game and the ability to Believe as a team is our greatest asset. 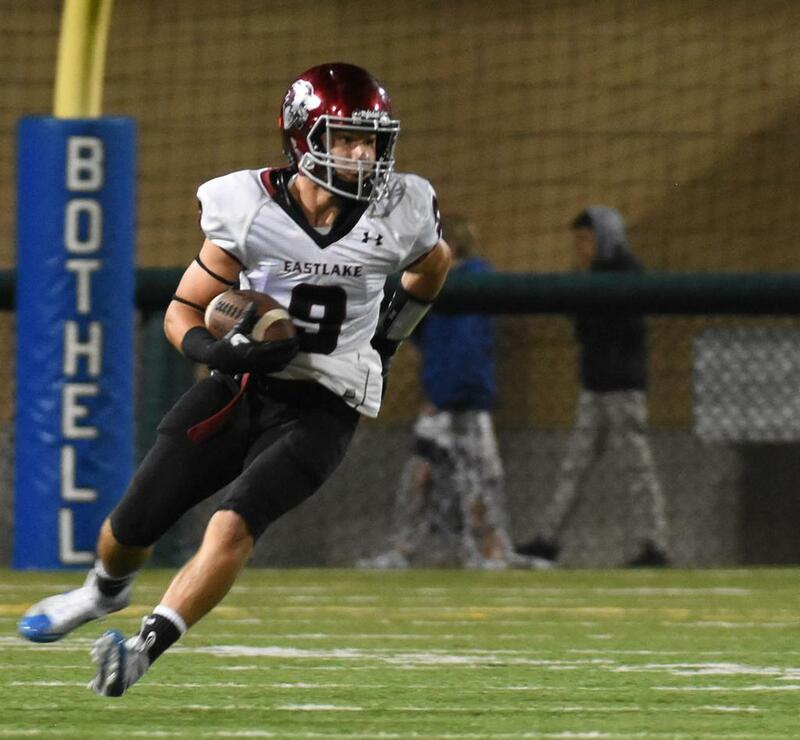 All of these things came into play Saturday night at Pop Keeney Stadium as Eastlake took on 9th ranked Bothell Cougars (3-1). 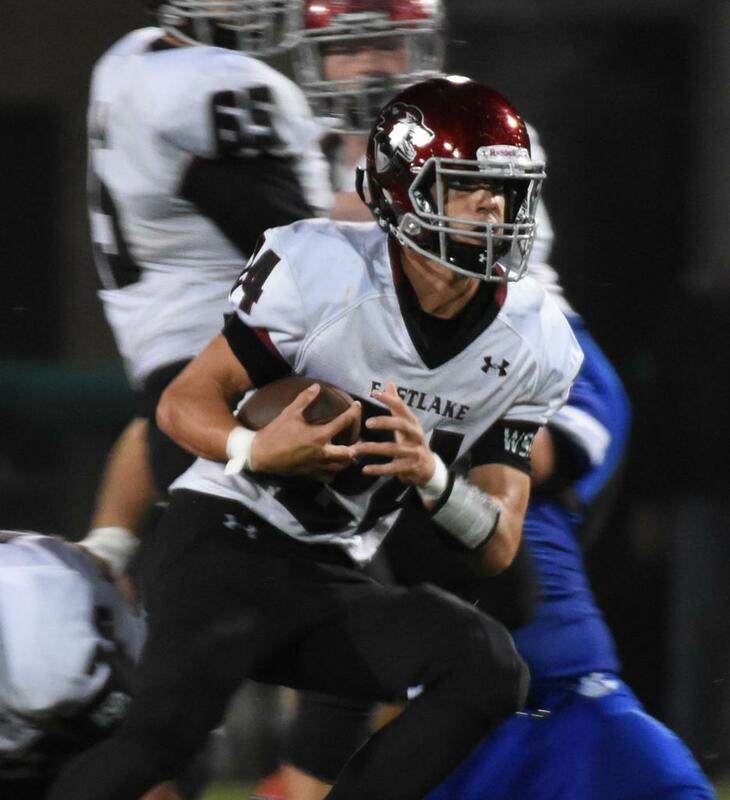 The Cougars are a talented Kingco team with a University of Washington commit at quarterback and were coming off a nationally televised win over Denver’s Mullen High School. 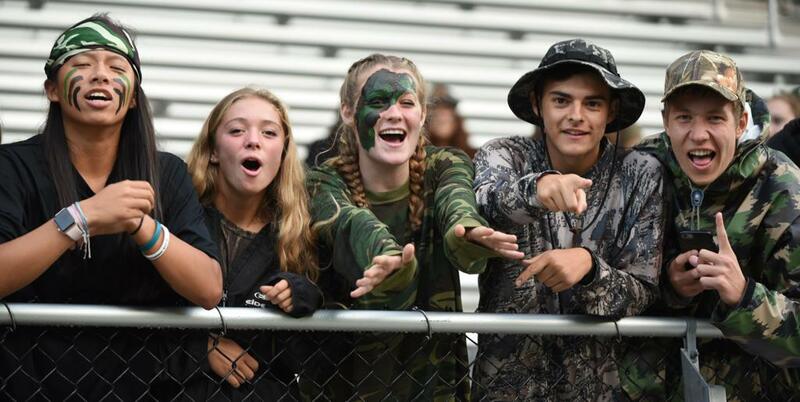 With the Eastlake student section amped up on “camouflage night”, the band blaring toward the Bothell stands and a strong showing of traveling fan support ready for kick off, Jack Matheson took the honors of the opening kickoff…kicking to the goal line. Bothell created a strong wedge up the middle and the returner found the seam, going untouched and taking the kick off to the house. 7-0 Bothell. We play 4 quarters for a reason! Eastlake’s first possession started well, converting on a 4th down “punt formation” pass play from Connor Brown to Jaxon Williams. 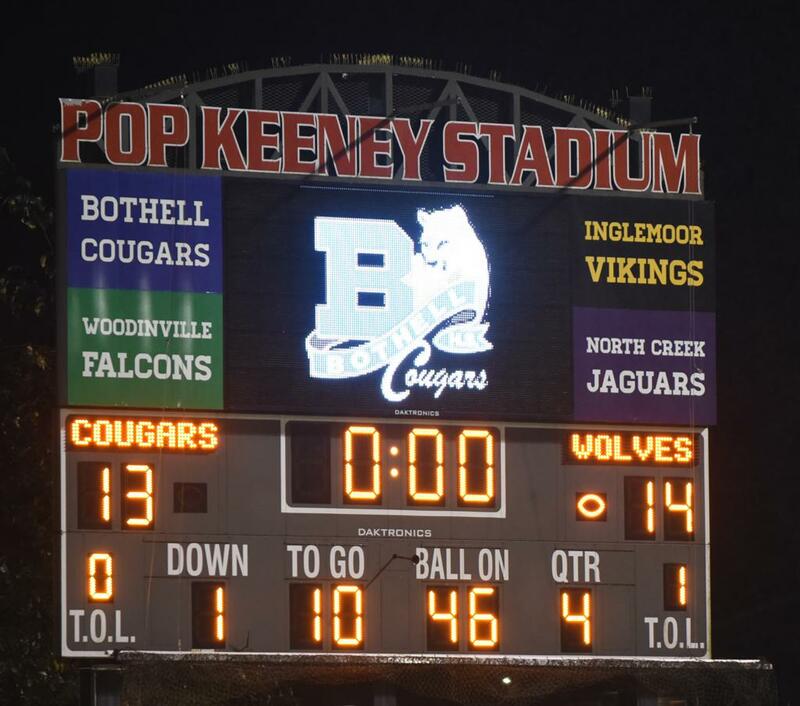 The drive would end in a punt, but the message to Bothell was sent. Be ready. Eastlake holds Bothell on the next possession and takes over on their own 40-yard line. The offense starts to click with creative play calling. A strong off tackle run by Chris Nelson for 8 yards and a run option by Brown for 15 yards followed by 15 yard sideline pass to Williams to move the ball quickly to the Bothell 20 yard line. On 4th down, a 36 yard field goal try by Matheson is long enough but just wide left. With both offenses trading possessions without points, Bothell looked to get on track starting at their own 20 yard line. 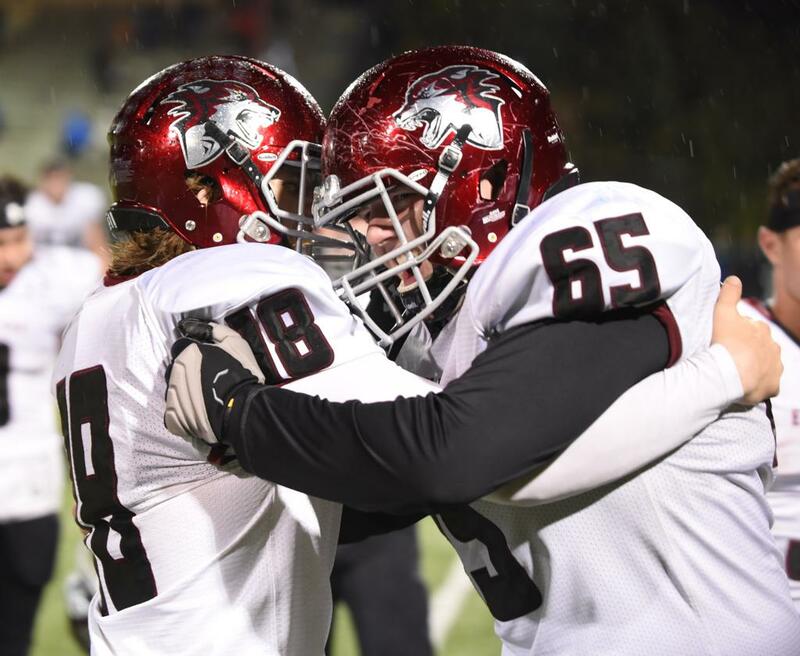 The Eastlake defense had a message of their own that would set the tone for the entire evening. On 1st and 10, Bothell quick pitches to the running back who is introduced to Hank Pladson in the backfield on a safety blitz. 5 yard loss. Bothell starts moving on a completion from Jacob Sirmon to DaVicious Wilson for a 15 yard gain. 1st and 10 Bothell. 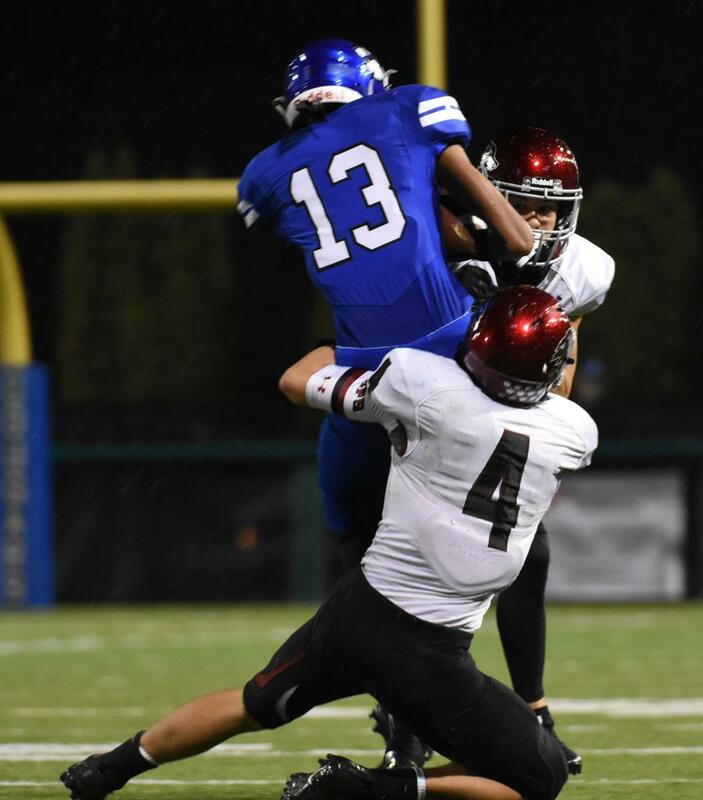 Spencer Thomspon comes up the middle from his defensive tackle position to record a sack, but gets held in the process putting Bothell at 1st and 25 from their own 20 yard line. Bothell wouldn’t recover on this drive throwing 3 long incompletions and forced to punt. Message sent…Eastlake defense. Belief…with the Eastlake defense putting pressure on Bothell in consecutive drives, the Eastlake Offense took their turn again. 1st and 10 at the Eastlake 30 yard line. An 8 yard swing pass to Williams, 1st down run for 4 yards by Nelson, Hunter Klinge pass completion for 8 yards, a 25 yard pass to Pladson with a great pass block from right tackle Zach Kennedy and the Eastlake offense is rolling as the 1st quarter ends with Eastlake at the Bothell 30 yard line. Bothell 7-0. 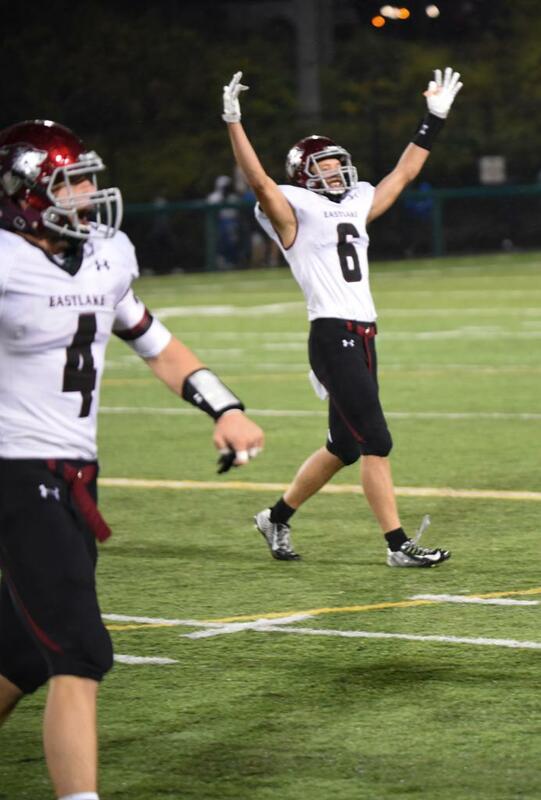 As the offense moved deep into Bothell territory, the Eastlake running game took over. Two 5 yard runs by Nelson for a 1st down, an 8 yard scramble by Brown, 3 yards by Garrett Carney up the middle for a first down. Eastlake FIRST and GOAL. A Brown run takes the ball to the Bothell 2 yard line. No field goals on this drive as Nelson, coming off his 5 touchdown performance last week, scores on a running play off the right side of the line. Matheson kick is good. Eastlake 70 yards in 11 plays. Score 7-7 with 9:44 to go until half-time. Message sent…Eastlake offense. With fans anxiously awaiting the result of the Bothell kick return, Bothell returns the ball to their own 27 yard line... Bothell’s chance to get their offense going. 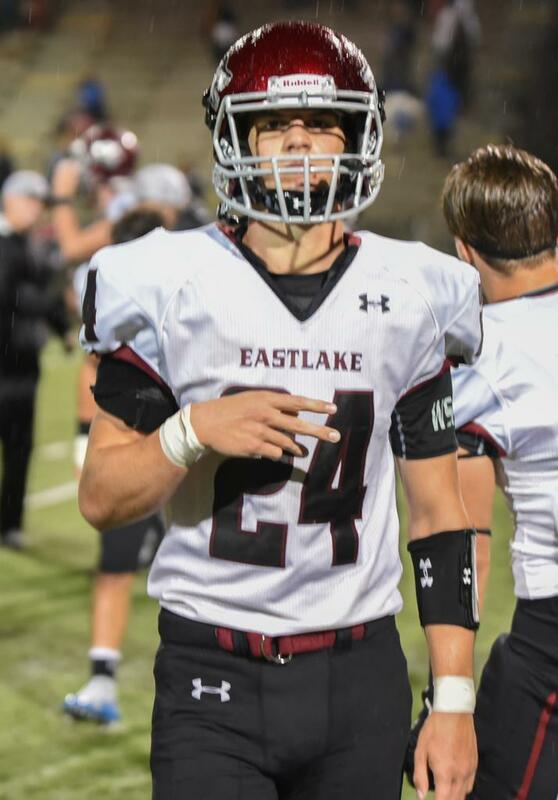 But the Eastlake defense would put together another great series…consecutive offensive plays with no gain, 15 yard pass completion with a great tackle by Reed Payne, tackle for -1 yard by Jack Hart, false start Bothell, 5 yard gain with a strong tackle by Sam Milton, PUNT. The Eastlake offense gets the ball on their own 25 yard line and continues to move the ball well with a strong balance of successful run and pass plays. The big play coming on a 25 yard pass completion from Brown to Nate Sutter on a left side post route. Add on a 15 yard personal foul penalty and Eastlake is back in Bothell territory. The drive would stall after a sack on 3rd down but a great punt by Brown would put the ball on the Bothell 8 yard line. With under 5 minutes remaining in the half, Bothell puts together their longest drive of the game. 15 plays and 90 yards. 90 yards is the key point here. With 3rd and goal from the Eastlake 2 yard line and 21 seconds remaining in the half, Bothell lines up in a doubles formation with two receivers on each side. Sirmon drops to his right to pass with pressure coming up the middle. Pass is thrown short to the inside slot receiver, but the ball, after being tipped by Williams in the endzone, goes straight up in the air. JUMP BALL! . . . Jack Hart…INTERCEPTION. Defense wins games. Belief! Both the Eastlake and Bothell offenses would trade field position most of the 3rd quarter as their offensive possessions would start promising but all end in punts as both defenses would deliver great coverage and run support in the secondary. With the 3rd quarter winding down, the Eastlake offense started at the Bothell 20 yard line. 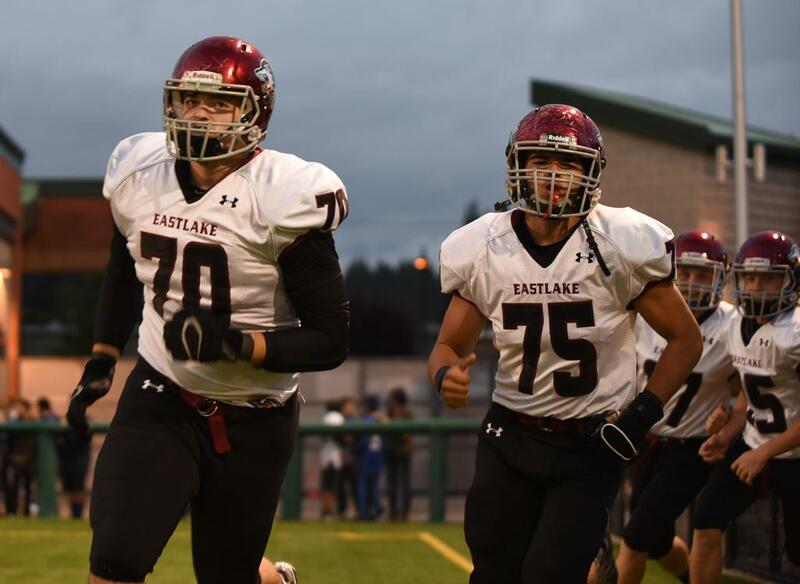 The Eastlake offensive line and running game would send another message. Run at will and eat up time. Nelson ran for 15 yards on the first play of the drive. Nelson had strong runs of 15, 15, 17, and 8 yards, with his biggest run coming on 4th down and half a yard from the Bothell 15 yard line. This time he got 3 yards. 1st and Goal. On 2nd down, Brown would fake the hand off to Nelson but keep it himself to take it in for a touchdown over the right side of the line. Matheson kick is good. 12 plays, 80 yards, and 7 points. 14-7 Eastlake with 8:26 to go in the game. Bothell would respond with a drive of their own. Starting on their own 23, Bothell is forced to punt after 5 plays. Eastlake fields the short punt, but fumbles trying to make a difficult catch, keeping the Bothell drive alive from the Eastlake 40 yard line. 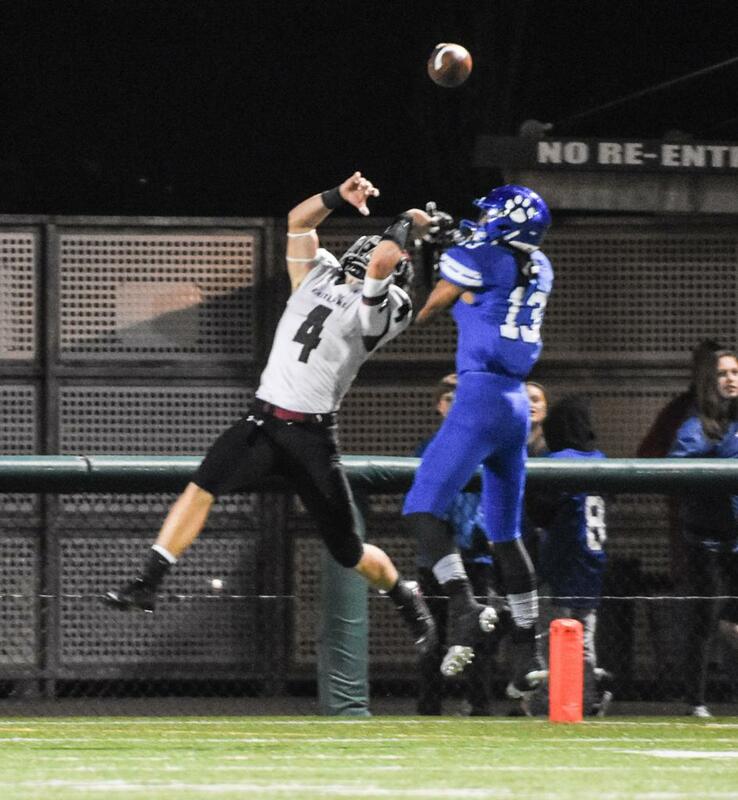 After consecutive plays of no yards with Bothell facing 3rd and 10, Sirmon would scramble to his left and let go an endzone bound 45 yard bomb that finds a Bothell receiver just behind the Eastlake coverage for a touchdown. Belief questioned? Bothell lines up to kick the extra point. Sutter comes off the left edge like a bullet, dives from 5 feet to the left of the kicker and blocks the Point After Touchdown (PAT) while in midair. 14-13 EASTLAKE with 5:46 remaining. Special teams matter! Belief never questioned! Fans and students feeling this could be the difference in the game. The Eastlake offense would eat up valuable time on two consecutive drives, punting on the 1st drive and getting stopped on 4th and 1 on the second drive with under a minute remaining. Bothell would take over at their own 35 yard line, needing at least 40 yards to have a potential game winning field goal. Sirmon would connect on two consecutive plays for 30 yards to DaVicious Wilson, but with 15 seconds to play, Sirmon would try one too many times to find Wilson as Klinge steps in front of the pass for an INTERCEPTION…Sealing Victory. Defense Wins Games. BELIEF! Eastlake would outgain the Cougars, 283 yards to 229 in total offense and win the turnover battle 2-1. A well-played game for the boys and the coaches. In talking to fans from Bothell after the game, aside from their compliments of a well-played game, they were in awe of our students and fans. Best they have seen all season long. Bring it again this week at home vs Skyline. Tell friends and family. This win moves Eastlake to 3-2 on the season with Skyline coming to Eastlake on Friday night. Thanks to Simon Puttick and Jeff Steinbok for photos!